Maiden Call at the ECT Euromax Terminal. With a capacity of 21.413 TEU, the OOCL Hong Kong is the largest container ship in the world. At the ECT Euromax terminal, an 8-cranes operation has been applied to the Al Zubara (UASC). Hutchison Ports ECT Rotterdam increasingly puts 7 or 8 cranes on the ECT terminals to handle the largest ships of her customers. 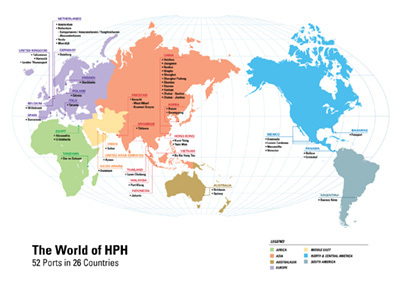 Cosco Ports (Rotterdam) has taken a 35% stake in the Hutchison Ports ECT Euromax terminal. This strategy partnership provides benefits for both parties. ECT celebrates its 50th anniversary! The container changed the world, ECT changed the world of the container. And with a view to the future ECT will continue to do so. 50 years ECT. Connecting the Future. The CMA CGM Sambhar is the last deepsea ship to call at the ECT City Terminal in the Eemhaven. Capitalising on the ever-expanding increase in scale, ECT definitely relocates the remaining operations still taking place in the city to its two deepsea terminals at the Maasvlakte. After nearly 50 years, the ECT City Terminal - better known as the Home Terminal - closes its gates. European Gateway Services (EGS) opens an office in Munich. This allows EGS to anticipate the wishes of the customer better and faster, among other reasons because knowledge of the local market is combined with knowledge of the processes in Rotterdam. ECT and the Port of Rotterdam Authority end their long-running dispute over the expansion of capacity in the port of Rotterdam. 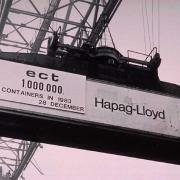 ECT handles the 150 millionth TEU since its inception. This makes ECT the first container terminal operator in Europe to achieve this unique milestone. 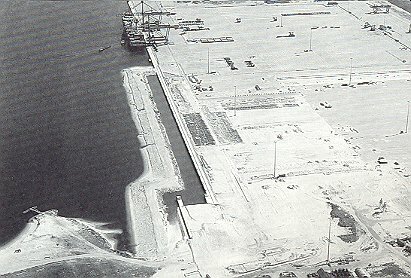 The Amazonehaven port basin is widened. This allows ECT to better handle ULCS. ECT also has its own extensive ULCS programme aimed at better serving the larger and larger seagoing vessels and offering customers optimum service levels. After a two-month voyage, five new quay cranes arrive at the ECT Delta Terminal. The cranes are part of a larger investment programme of ECT; the ULCS upgrade programme, which enables ECT to offer its customers a state-of-the-art terminal that is ready for the future. The Euromax Terminal handles its one millionth container and from then on unloads containers remotely from the office using monitors. 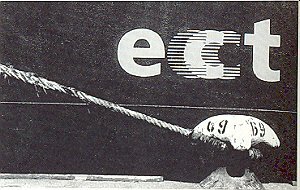 ECT participates in a holding company for the global exploitation of ShoreTension: an invention of Rotterdam’s boatmen for the safe mooring of vessels. The hybrid AGV is introduced. This is an important next step in sustainable terminal automation. The ECT Delta Terminal and the Euromax Terminal Rotterdam are officially recognised as Authorised Economic Operator (AEO) by Customs. This means the two ECT terminals can count on major customs simplifications, allowing them to even better fulfil their role in global logistics chains. ECT starts the year with a throughput record: at the three deepsea terminals (ECT City Terminal, ECT Delta Terminal and Euromax Terminal Rotterdam), more than 100,000 containers are handled in a single week. That is a line of containers stretching from the Maasvlakte all the way to Berlin. 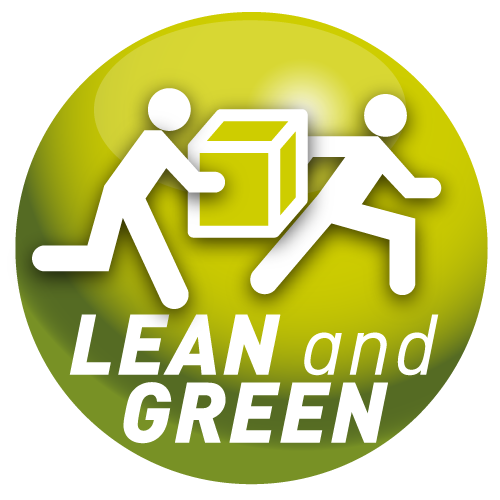 ECT wins the first Lean & Green Award, an initiative aimed to promote sustainability in the logistics sector. Later, ECT will also win the Lean and Green Star and the Personal Mobility Award (for its company-organised transport). Through the launch of subsidiary company European Gateway Services (EGS), ECT introduces a new service for its customers. EGS specialises in synchromodal transport - rail, barge and truck - to the European hinterland. To ensure optimal service rendering, ECT makes 100% electronic data exchange mandatory at all of its deepsea terminals. The Euromax Terminal and Delta Barge Feeder Terminal are spectacularly opened. For the Euromax, the CKYH alliance (Cosco, "K" Line, Yan Ming and Hanjin) is the partner of ECT. The Barge Feeder Terminal further increases ECT’s significance as a European feeder hub. ECT meets the global ISPS Code for an improved security of terminals and ships against terrorism. Hutchison Port Holdings acquires a majority of ECT shares. ECT with that becomes an integral part of this Hong Kong-based global company. From now on, the letters ECT stand for Europe Container Terminals. Accross from the ECT Delta Terminal, ECT takes the Rail Service Centre Maasvlakte in use. ECT gets new owners: Hutchison Port Holdings, the Port of Rotterdam Authority, ABN AMRO and Stichting Werknemersaandelen ECT. At the Delta Terminal, the first 450 metres of the new Delta Dedicated West (DDW) are taken into use. To make efficient use of the space, ECT starts stacking four-high here. 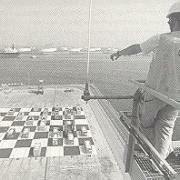 Top chess players Kasparov and Timman play a chess game at the Delta Terminal using containers which have been tranformed into chess pieces. 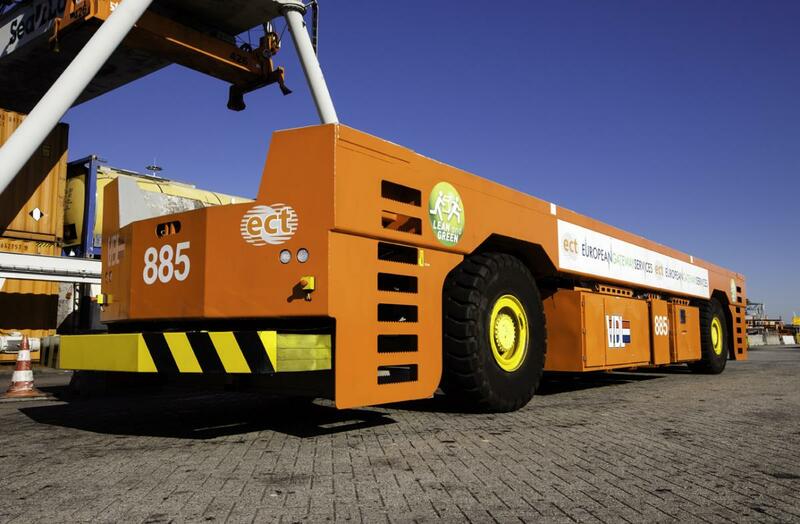 ECT opens its own inland terminals in Duisburg (Germany) and Willebroek (Belgium). 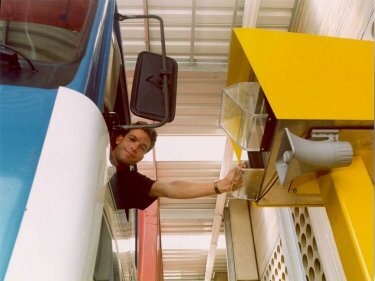 The Cargo Card - a biometric identification card for truck drivers - is introduced. This card stands for safety as well as for time saving. Truck drivers do not need to more from their cabin, but identify with their left hand. Delta Dedicated East (DDE) is launched. Crown Prince Willem-Alexander is the guest of honour at the opening ceremony. The first customer is the Global Alliance – the shipping lines Nedlloyd, APL, MOL MISC and OOCL. The automated Delta / Sea-Land terminal is commissioned. 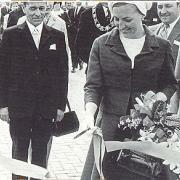 The official opening is performed by Queen Beatrix. This is the first automated terminal in the world. ECT merges with Quick Dispatch and Müller Thomsen. This gives the acronym ECT a new meaning: Europe Container Terminus changes to Europe Combined Terminals. The twistlock has been the symbol of ECT for years. After the merge ECT uses the bollard as the new symbol. ECT and Sea-Land sign a new 25-year contract. The shipping line is given an exclusive terminal at the Maasvlakte which features an unprecedented automated concept with Automated Guided Vehicles (AGVs) and Automated Stacking Cranes (ASCs). 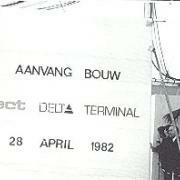 Mayor Peper of Rotterdam officially opens the Delta Terminal. It is the start of a new era for ECT. 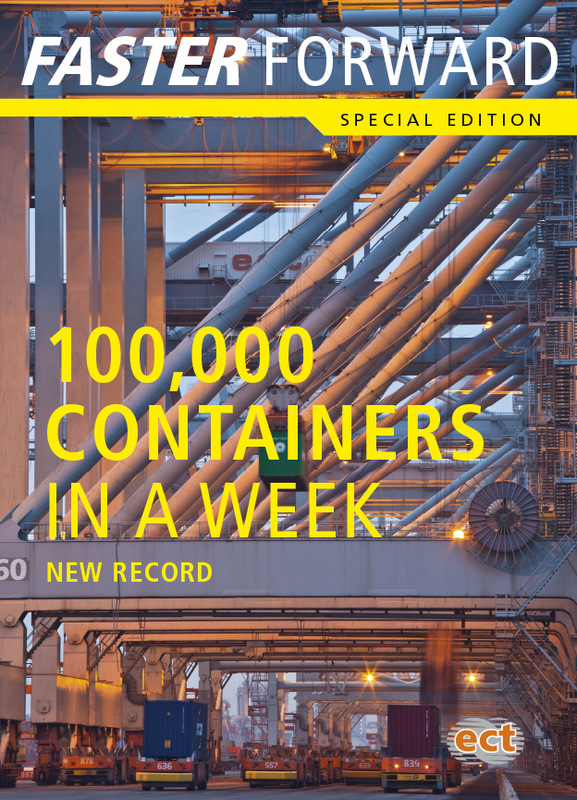 For the first time ever, ECT handles more than 1 million containers in one year. 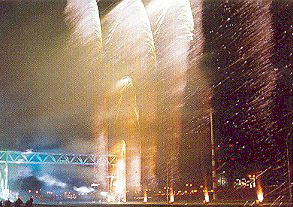 This is still done entirely at the Eemhaven, already known as the Home Terminal for some time. In Venlo, ECT takes a rail terminal into use as a consolidation and distribution point for container cargo to and from Germany and the rest of the Eruopean hinterland. Adding Venlo to the network was part of the strategy of ECT to maintain the competitive position of Rotterdam. 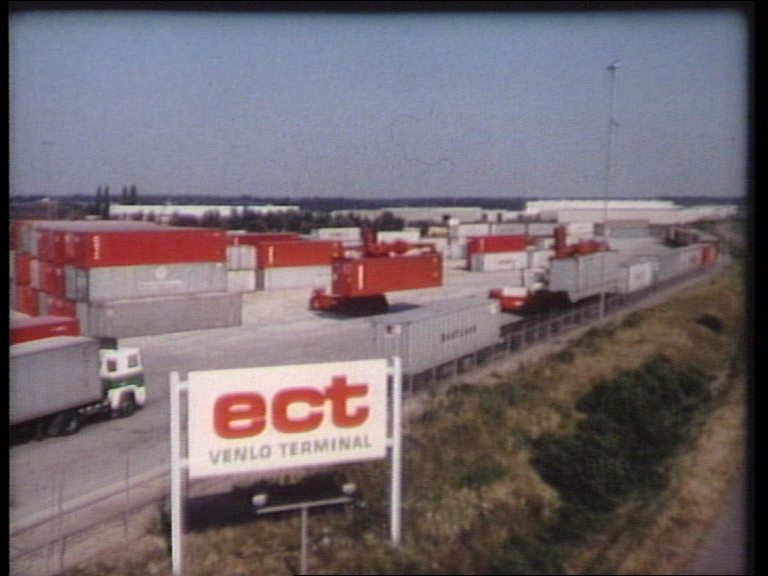 This inland terminal is still owned by ECT and is part of the network of EGS. On the 28th of April, the festive starting signal is given for the construction of the Delta Terminal at the Maasvlakte. ECT had already been approached numerous times by the municipality of Rotterdam in the past with the proposal to relocate the company from the Eemhaven to the Maasvlakte to solve the structural space problem there. ECT is the first company where this system is introduced. After completing a day shift, workers would return home five days a week, two more than in the four-shift system. Workers also no longer worked seven shifts back to back, but five. All this was aimed at promoting the social wellbeing of the employees. 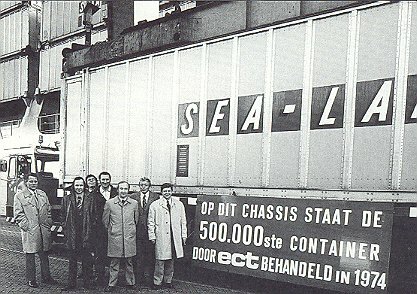 For the first time ever, ECT handles 500,000 containers in a single year. A true record at this time! 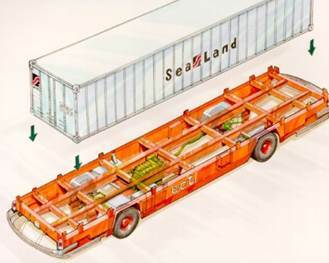 De container was owned by shipping line Delta-Sealand. As of the 1st of January, ECT gets its own collective labour agreement for the first time. This makes it possible to truly operate around the clock - seven days a week, 24 hours a day. That takes place in a three-shift operation. Within the ECT complex at the Eemhaven, shipping line Sea-Land gets its own terminal at the Prins Willem-Alexanderhaven. The facility is officially opened by Princess Margriet on the 27th of April. 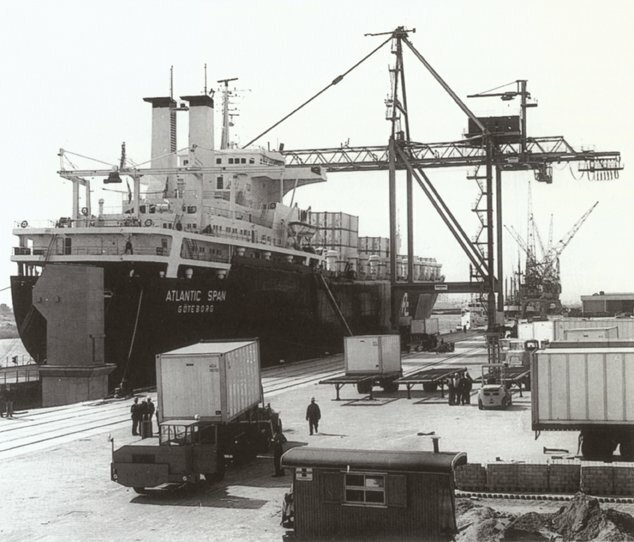 In the course of 1967, ECT gets its own terminal at the Prinses Margriethaven. On the 31st of August, the Atlantic Span of shipping line ACL is the first ship to moor here. 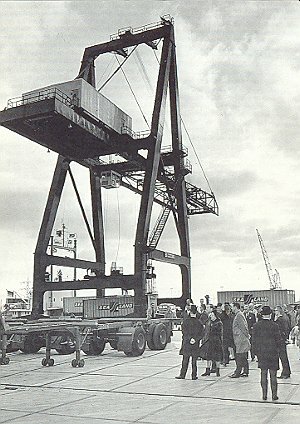 At the time ECT has one crane.